How often have you heard the phrase, "Google it"? I'm guessing a lot. Whenever we have a question or want to know something, the first thing we do, or at least I do, is "google it." No matter what. I always go to Google. Sometimes, I literally just google the question itself. Now, I know our students also work/think this way. Their number one solution is to "google it" as well. However, as you have probably seen yourself, some students are not good at finding information on the internet and are not good at 'googling it.' But we can't abandon it because Google is such a wealth of information, we must use it! It's a great resource. So, instead of complaining about how our students are terrible at searching for information on the internet, help them get better at it! Teach them! Fortunately, Google is awesome and have created a "activity" that allows students (or anybody) to practice searching for information on Google. 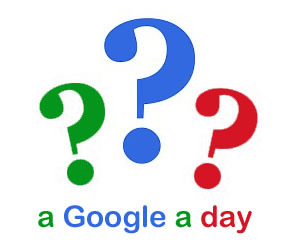 It's called "A Google A Day" (www.agoogleaday.com) and it's awesome. It's a great way to not only get better at searching with Google, but also to challenge our students and get them to think! Here's how it works: Google gives you three questions, one at a time. For each question, you must figure out the answer by Google searching keywords, phrases, questions, etc. Once you figure out the answer, you enter it and then move on to question 2 (if you get it right, of course). The faster you answer the questions correctly, the more points you get, so there's definitely a little bit of competition and intensity involved. It's a fun way for students to challenge each other. A great activity if students are done with their work or looking for something to do in study hall. Give it a try yourself and become a Google Search Pro!